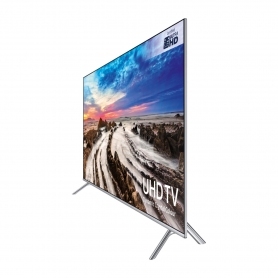 Available in a modern silver finish, this Samsung Smart TV is packed with features to improve your viewing experience. 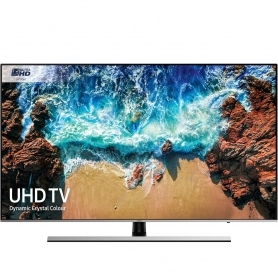 Enjoy TV live or on demand, and stream in detailed 4K resolution. The UE75MU7000TXXU also features 40 W RMS sound output, giving you a volume range to suit almost any living space. 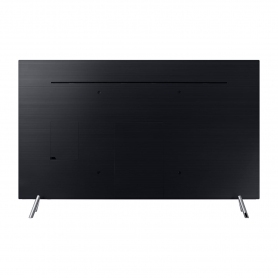 As a Smart TV, this Samsung model comes with built-in Wi-Fi for online access. TVPlus tuners come with the UE75MU7000TXXU, giving you HD TV channels straight from the aerial. Catch up services, such as iPlayer, All4 and ITV Hub can also be used, so you can watch your shows at a time to suit you. Samsung’s EPG will let you know what’s on and when, and lets you view information about each show. A hub for home entertainment, the UE75MU7000TXXU even offers cloud gaming services. There’s no need for a console, just connect a gamepad and play in ultra-high definition. 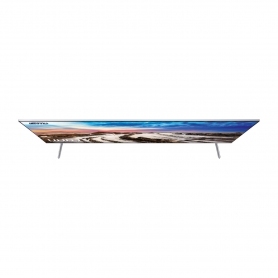 Active Crystal Colour – For stunning contrast and more natural and lifelike pictures. 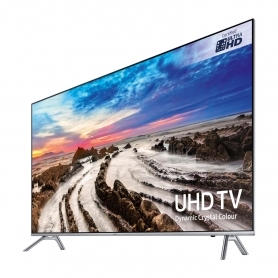 An improved Samsung chip set extends the colour range of the UE65MU7000TXXU beyond that of other UHD TVs. Enjoy true to life colours and more intense shades. 10-Bit Panel – Most screens support 8-bit colour, giving a range of 16.8 million colour mixes. While this sounds like a lot, a 10-bit panel allows for just over 1 billion mixes, for a more refined, smoother gradation between colours. Mega Contrast – Boosts the contrast ratio of the UE75MU7000TXXU. See more vivid colours and sharper detail. See how good your favourite shows look with Samsung’s range of clever features. You never know, the UE75MU7000TXXU could turn up a few details you missed. Despite the powerful processing of this model, its A+ for energy efficiency means it won’t cost so much to run. Simply run all of your devices through the One Connect Box to prevent clutter at the back of your screen. The One Connect Box also lets you watch 4K content through a streaming site such as Netflix. 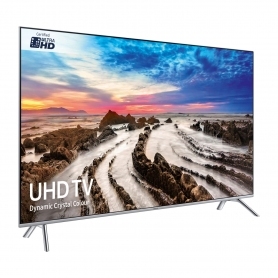 Should you wish to connect directly to this UHD TV, it has four HDMI ports to suit most modern devices and consoles. 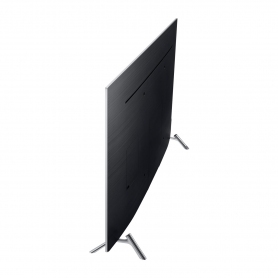 A handy A-shaped stand also comes with this model, providing support and balance to the screen. Samsung has even refined this TV’s Smart Remote. With a simplified button layout, you can use the Smart Remote to easily navigate the UE75MU7000TXXU, and it features a built-in mic for voice command options. 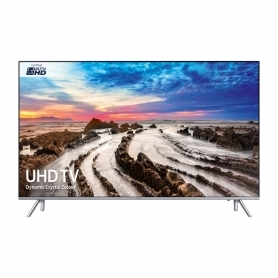 With online access, a range of intelligent features to improve picture quality, and the helpful One Connect Box, the UE75MU7000TXXU could change the way you watch TV. Buy yours now.